Citizens State Bank was chartered in 1919. In 1981, our bank became a subsidiary of Citizens State Financial Corporation, a locally owned bank holding company. Our Board of Directors is composed of individuals who have a deep vested interest in community progress and success. With the majority of our officers each having in excess of twenty-five years banking experience, and a staff of friendly employees, we strive to provide quality products and services with a hometown touch. 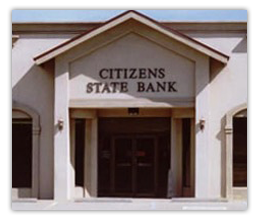 Citizens State Bank is located in Polk County on the east side of U. S. Highway 59, at 300 North Home Street in Corrigan, Texas. Nestled in the heart of the piney woods, our area has a friendly, East Texas rural setting with timber as a primary industry.